This set of extensions manipulates the colors of an object or Group of objects. The extensions are implemented through a set of Python scripts (located in the directory share/inkscape/extensions). The use of Python scripts is a temporary measure until the capability is incorporated natively into Inkscape. The color mapping is calculated in the RGB color space except for the extensions that modify HSL values, which are calculated in HSL color space. If no objects are selected, the color change will be applied to the entire drawing. An object's Stroke and any Gradient are also changed. Converts an image to black and white. The extension first calculates brightness (luma) using the YUV color space (for NTSC and PAL standard definition television) and then applies a threshold of 50%. Left: Original colors. Right: Colors after applying the Black and White extension. Brighten the color of an object or Group of objects. This extension has the property of making dark colors more intense but washing out light colors. The effect is subtle so multiple applications may be required. Left: Original colors. 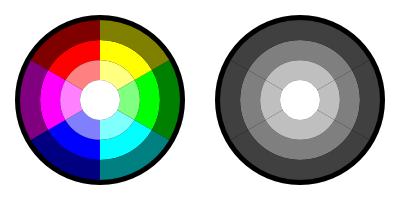 Right: Colors after applying the Color Brighter extension. This extension allows color custom transformation functions to be defined. Standard math operations are allowed such as +, −, ×, and /. If a resulting value is outside the allowed limits, it is set at the minimum or maximum allowed value. Custom Color Extension dialog set to reduce R (red) to one half. Left: Original colors. 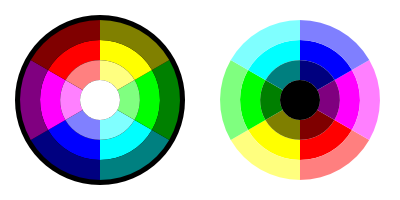 Right: Colors after applying the Color Custom extension with the specification that R should be divided by 2. Darken the color of an object or Group of objects. Each R, G, and B component of a color is set to 90% of its previous value. The effect is subtle so multiple applications may be required. Left: Original colors. 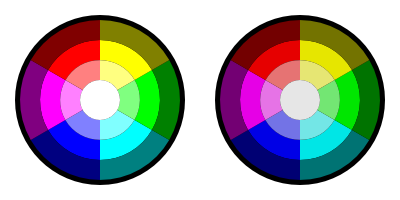 Right: Colors after applying the Color Darker extension. Desaturate the color of an object or Group of objects. This sets the values of R, G, and B to the average of the maximum of R, G, and B; and the minimum of R, G, and B. 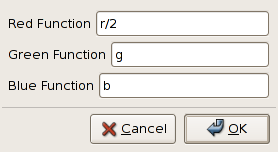 For example, R would be set to (max( R, G, B ) + min( R, G, B ))/2. Left: Original colors. 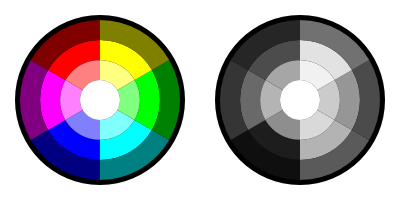 Right: Colors after applying the Color Desaturate extension. Change the color to a gray using the formula for Luminance used by the NTSC and PAL television standards. This sets the color to a lightness (Y) defined by: Y = 0.229 × R + 0.587; × G + 0.114 × B. See the Wikipedia entry for YUV for further information. Left: Original colors. Right: Colors after applying the Color Grayscale extension. Decrease the hue (see the section called “HSL”) of a color. The hue is decreased by 5% (of the full hue range) or equivalently, a rotation of 18° around the color circle. This, for example, means that a pure red picks up a touch of blue in the RGB color space. Left: Original colors. Right: Colors after applying the Color Less Hue extension. Decrease the lightness (see the section called “HSL”) of a color. The lightness is decreased by 5% (of the full lightness range). If the lightness is already less than 5%, it is set to 0%. The effect is subtle so multiple applications may be required. Left: Original colors. 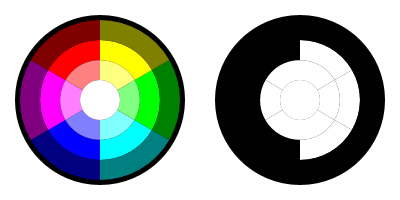 Right: Colors after applying the Color Less Light extension. Decrease the saturation (see the section called “HSL”) of a color. The saturation is decreased by 5% (of the full saturation range). If the saturation is already less than 5%, it is set to 0%. The effect is subtle so multiple applications may be required. Left: Original colors. Right: Colors after applying the Color Less Saturation extension. Increase the hue (see the section called “HSL”) of a color. The hue is increased by 5% (of the full hue range) or equivalently, a rotation of 18° around the color circle. This, for example, means that a pure red picks up a touch of green in the RGB color space. Left: Original colors. Right: Colors after applying the Color More Hue extension. Increase the lightness (see the section called “HSL”) of a color. The lightness is increased by 5% (of the full lightness range). If the lightness is already more than 95%, it is set to 100%. The effect is subtle so multiple applications may be required. Left: Original colors. Right: Colors after applying the Color More Light extension. Increase the saturation (see the section called “HSL”) of a color. The saturation is increased by 5% (of the full saturation range). If the saturation is already more than 95%, it is set to 100%. The effect is subtle so multiple applications may be required. Left: Original colors. Right: Colors after applying the Color More Saturation extension. Invert the color. For example, an R value of 64 (25%) becomes an R value of 191 (255−64, or 75%). Left: Original colors. Right: Colors after applying the Color Negative extension. Randomize the color of selected objects or all objects if no object is selected. You can choose which of the HSL color parameters to randomize (hue, saturation, and/or lightness). A grid of gray squares after randomizing their colors. 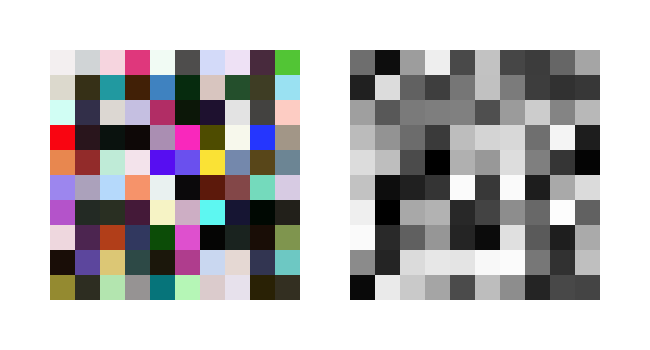 Left: Randomizing hue, saturation, and lightness. Right: Randomizing only lightness. Set the B value in RGB to 0. Left: Original colors. 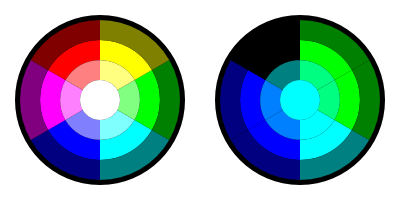 Right: Colors after applying the Color Remove Blue extension. Set the G value in RGB to 0. Left: Original colors. 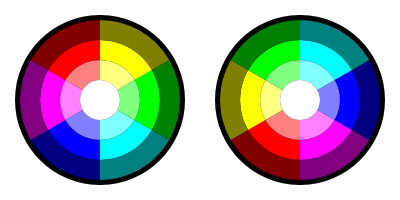 Right: Colors after applying the Color Remove Green extension. Set the R value in RGB to 0. Left: Original colors. 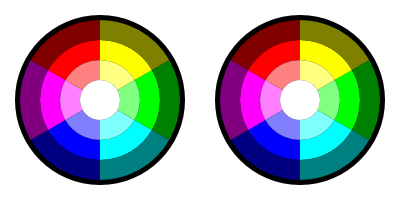 Right: Colors after applying the Color Remove Red extension. Replace a color among selected objects or all objects if no object is selected. Colors are specified in RRGGBB hexadecimal form. Color to be replaced must match exactly. 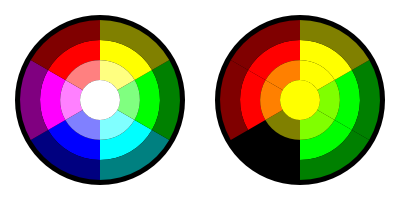 Rotates color (hue) by 120° around the color circle. Left: Original colors. 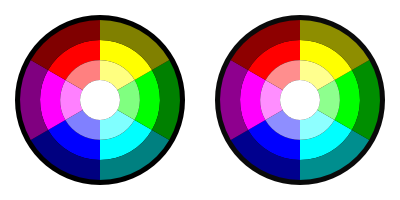 Right: Colors after applying the Color RGB Barrel extension.